The department offers opportunities for the Education and Research in a wide spectrum of areas in Mathematics. The knowledge quotient of the department is formed by 16 faculty members who are competent researchers and quality teachers who tirelessly help the students learn the basics as well as the cutting edge areas in the field of mathematics. The students are trained and equipped with a strong foundation in mathematics thereby enabling them to become top scholars and scientist of the future society. The department of mathematics functions to the needs of the engineering students at both undergraduate and post graduate level and also the department of mathematics serves to arts and science, architecture and management studies. The departments also offers B.Sc, M. Sc, M. Phil, and Ph.D programs in core mathematics. The department has taken a lead role in filling the gaps between the schooling and higher education by using various methodologies. The department is committed to train the students to make them motivated to be come dedicated engineers and scholars. Eligibility: Pass in the Higher Secondary Examination with Mathematics, Physics & Chemistry as main subject of study. It is a job oriented professional course. Mathematics has influence over many fields such as science, engineering, and statistics etc. B.Sc mathematics trains the students in areas such as Algebra, Probability, statistics geometry, calculus etc. Students who are interested in mathematics will love the course . B Sc mathematics graduates have opportunities for jobs in many sectors. Interested students can go for higher education. Eligibility: Pass in the B.Sc degree Examination with Mathematics as main subject of study. It is a post graduate program of two years with four semesters. Department offers PG programme in Mathematics for the academic uplift of UG students in Mathematics which paves the way for acquiring in depth knowledge in Mathematics. This helps the students in gain confidence to deal with problems of the Mathematics. Completion of this programme gives better prospects of higher studies in India and abroad in addition to offer of employment to students of their choice in this field. Full time course Post Graduate Degree in Mathematics of this University (or) of any other University recognized by this University with minimum of 55% of marks. Mathematics department has been in existence since its inception and conducts courses catering to the need of students in the acquisition of subject knowledge, scope for higher studies and employability. There is an exponential growth and steady progression in the conduct of this programme. Also conducts technical seminars and conferences at national level to became conscious of recent trends in the subject and diversified science topics to excel in the field of Mathematics. Post graduation in the field of Mathematics. This department is in possession of faculties with Doctoral degrees and staff with adequate subject knowledge to impart right directions in the field of research oriented topics and project work. Department is in the process of attracting more students by way of conducting National and International seminars and publication of research works in reputed journals to highlight uniqueness . To assist students in acquiring a conceptual understanding of the nature and structure of Mathematics, its processes and applications. To Provide high quality Mathematics graduates who are relevant to industry and Commerce, Mathematics Education and Research in Science and Technology. 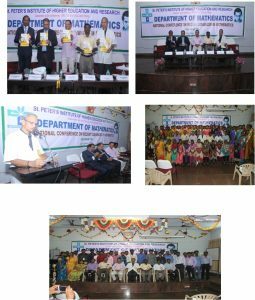 One day National conference on recent advances in mathematics NCRAM’18 was conducted on 25.04.2018. The chief guest for this function was Dr.B.R.Shankar, Associate Professor, NIT Mangalore and Dr.S. Narayanamoorthy, Associate Professor Bharathiyar University Coimbatore, and various speakers on this occasion includes Vice Chancellor, Director (R&D), Dean (R&D) and Director Academic and Registrar of our institution. About 100 M.Phil and Ph.D scholars presented their findings on this occasion and certificates were issued for all including merit certificate.